The result, this pearl briolette ring that complement this pair of earrings I made few weeks back. They are kind of cute and fun. 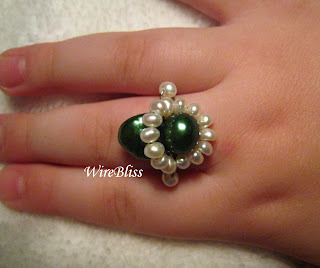 The ring is wire wrapped with 23g stainless steel wire and 4mm pearl beads surrounding the briolette. This is a Size 7 ring. That is one -cute- ring indeed. So are the fingers!